National Mathematics Coordinator at the Ministry of Education, Dr. Tamika Benjamin addresses JIS Think Tank session, on March 11. Dr. Benjamin was giving an update on the up-coming Mathematics Exposition scheduled for Thursday, March 13 at the University of West Indies, Mona Campus. 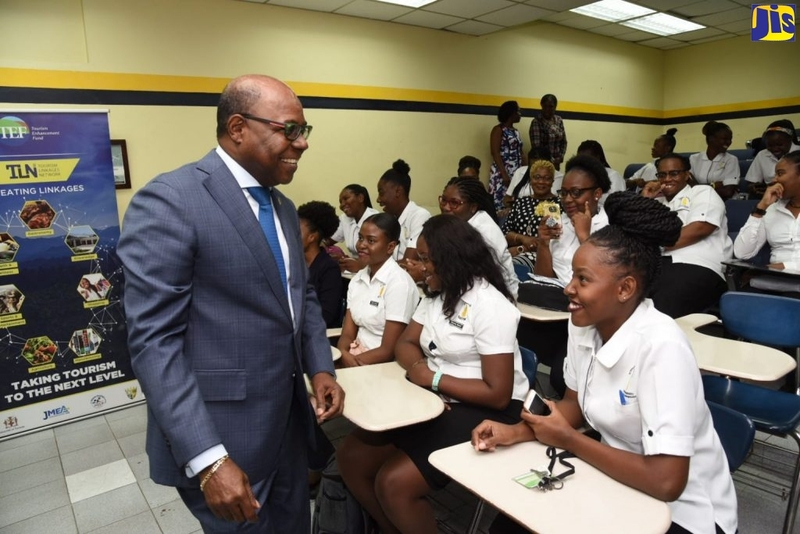 Over 6,000 students from 200 learning institutions across the island are expected to gather at the University of the West Indies (UWI), Mona Campus on Thursday, March 13, to participate in the second staging of the Ministry of Education’s Mathematics Exposition. The day’s events will begin at 9:00 a.m. with an opening ceremony in the Old Library at UWI. The expo is one of the major activities planned for Math Week, which is being observed from March 9 to14 under the theme ‘Math Revolution Equals Economic Solution’. Addressing a JIS Think Tank session on (March 11), National Mathematics Coordinator in the Ministry of Education, Dr. Tamika Benjamin, said this year’s theme emphasises that improved performance in mathematics will be a critical part of Jamaica’s ability to take advantage of the many opportunities for economic growth and development. She noted that the logistic hub initiative is one such opportunity. Students will be able to view booths mounted by various professional bodies and private and public sector organizations such as the Jamaica Stock Exchange, the Insurance Association of Jamaica, HEART Trust/NTA, Port Authority of Jamaica, Shipping Association of Jamaica, the Caribbean Maritime Institute, the Jamaican Institute of Engineers, the National Meteorological Service, the University of Technology (UTech), Mico University and the University of the West Indies (UWI). “The UWI has come on board this year in a more significant way as one of the main sponsors. They will be creating a Mathematics Winter Olympics Village, which will be one of the main features of the expo. Students will have an opportunity to explore mathematics in a recreational setting,” Dr. Benjamin said. “The main objective of the expo is to create an opportunity for students to interact with the subject in way that is fun, engaging and that helps them to see the relevance of mathematics and develop a level appreciation for some of the concepts. Teachers and principals will also have the opportunity to see technology that are available to support the teaching and learning of mathematics whether through software or other tools that are critical to the teaching and learning process,” Dr. Benjamin explained. The day’s events will begin at 9:00 a.m. with an opening ceremony in the Old Library at UWI. Other activities are being planned across other educational regions. Several schools within the regions will host math competitions and career days that are focused around careers that are driven by mathematics.